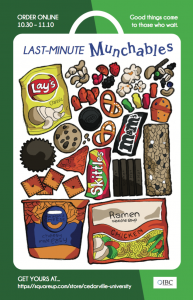 Munchables were a care package with a personalized note that could have been purchased online through the IBC Square store and sent to students on the campus of Cedarville University with no shipping or handling costs. 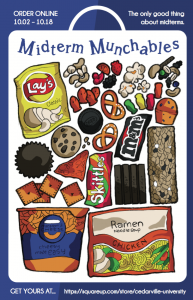 People on or off campus could send these packages, including parents. Munchables came with three different bag options. The three options were the Ultimate Bag, Standard Bag, and the Basic Bag. The Ultimate ($25) came with two of all 20 snack options, the Standard ($15) had one of everything, and the Basic ($10) only had 15 of our snack options. The IBC had two runs for ordering and delivering Munchables. The first run, Midterm Munchables, processed orders from 10/2 to the end of 10/18 and delivery for this run was be 10/23 to 10/25. The second run, Last-Minute Munchables, processed orders from 10/30 to the end of 11/10 and delivery was from 11/13 to 11/15. 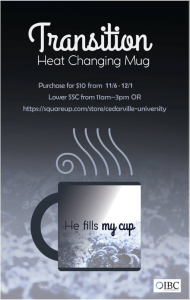 A plain black mug that transitioned into a white mug with a spiritually based design when a hot liquid was added. This transition feature occurred while the mug was filled with a hot beverage. The design featured the biblical reference from Psalm 23 “He fills my cup” along with a wave along the bottom of the mug. This mug was priced at $10. These Jacket Rags were designed to promote school spirit at various sporting events. 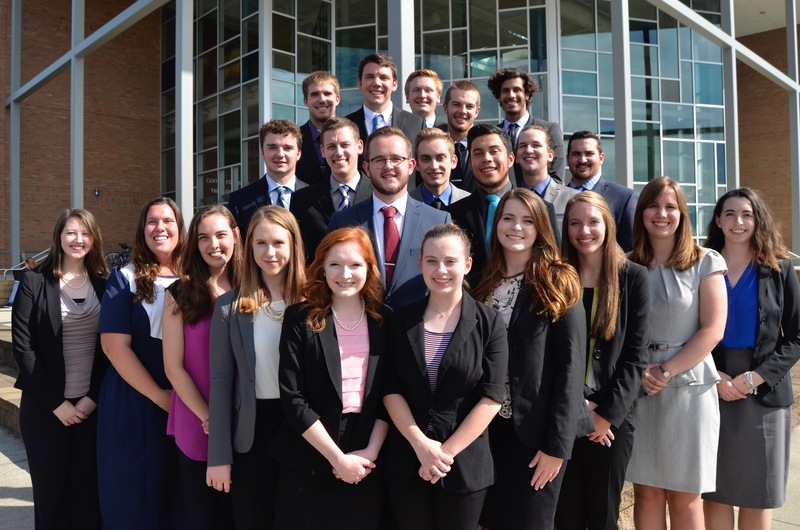 With a selling price of $3, the IBC expected to sell these to Cedarville students and alumni with school spirit. 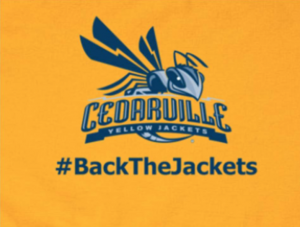 The Jacket Rag was made of thin, yellow material printed with the Cedarville logo and “#backthejackets” printed in blue. 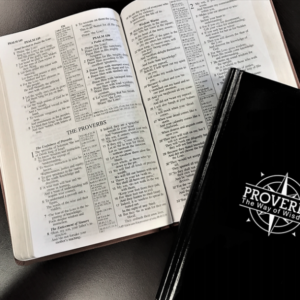 A hard-cover journal that contained an outline of Dr. White’s Proverbs Series for the academic year and a journal to study the book of Proverbs, along with a topical guide to the book of Proverbs. Dr. White’s sermon outline took up the first five pages of the journal, with 20 blank pages afterward to take notes. The journal contained many pages afterward to take notes and reflect on reading from the book of Proverbs. The journal featured Dr. White’s compass symbol, an introduction for the product by Dr. White, and “Way of Wisdom” title. This product sold at $15. The church project sought to provide local churches with custom logos for mugs. This product fulfilled our desire to create an IBC product to reach an off-campus market and build relationships with local churches. Our custom mugs could be used for new-members, baptisms, mission’s trips, and sermon series promotions.